Bio-fuels have been around a while, just like the concept of hydrogen fuel cell-powered vehicle. Nissan is taking these two concepts and combining them into its Solid-Oxide Fuel Cell powertrain. But this is no theoretical lab experiment. No, Nissan has built a working model with its mid-size NV cargo van. It’s called the e-Bio Fuel-Cell and it offers the benefits of a hydrogen fuel-cell without the need for compressed hydrogen gas and the complicated infrastructure required to handle it. Rather, the e-Bio Fuel-Cell runs on bio-ethanol harvested from corn or sugarcane and can be dispensed in liquid form the same way traditional gasoline and diesel fuels have been for the last century – at a filling station. 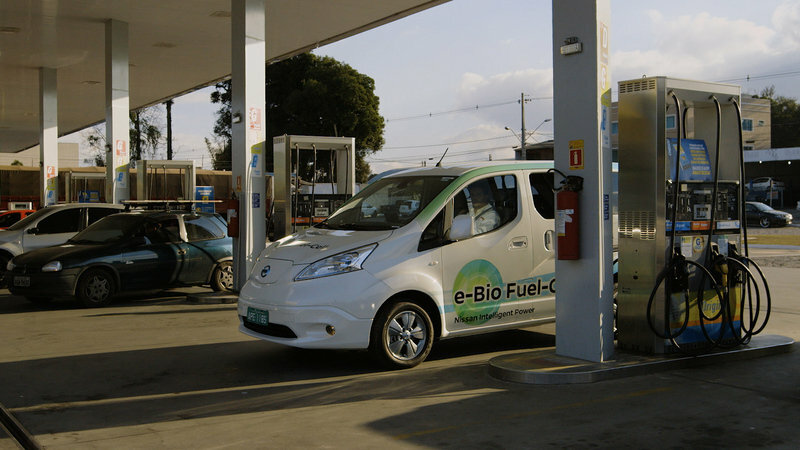 "The e-Bio Fuel-Cell offers eco-friendly transportation and creates opportunities for regional energy production… all the while supporting the existing infrastructure," says Nissan president and CEO, Carlos Ghosn. "In the future, the e-Bio Fuel-Cell will become even more user-friendly. Ethanol-blended water is easier and safer to handle than most other fuels. Without the need to create new infrastructure, it has great potential to drive market growth." Nissan says this NV e-Bio Fuel-Cell concept van runs on 100 percent ethanol to charge a 24 kWh battery, which affords more than 373 miles of driving range via an electric drivetrain. And of course, it does this with a very small global impact. The little CO2 emissions generated by the e-Bio Fuel-Cell is offset by the growing process of the corn and sugarcane, effectively canceling out the vehicle emissions for an overall zero-emissions impact. Continue reading for the full run-down and informative video. Save for the colorful wrap, this Nissan NV200 isn’t much different than the standard cargo or passenger van. There are small differences, however. The main change is up front. The grille has been replaced with a Nissan LEAF-like panel. It’s not a door for a charging port, though. Fueling is done at the side of the van, just like a regular gasoline-powered NV200. The bumper area has also been smooth out, helping with aerodynamic efficiency. Around back, Euro-style clear taillights replace the standard all-red units, giving the van a clean look. Blue Nissan logos are also found front and back, and on the center caps on each wheel. Nissan hasn’t released any information on the e-Bio Fuel-Cell NV200’s interior, but we imagine it remains relatively stock. 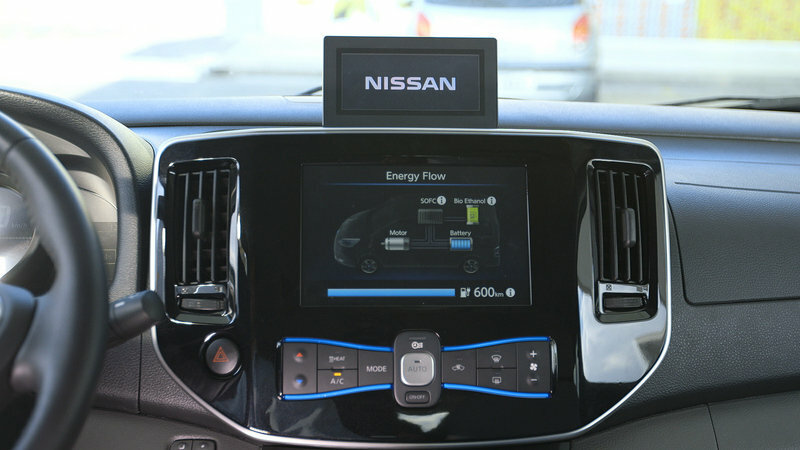 The accompanying video Nissan released does show a unique charging display that details the workings of the fuel cell system. The magic behind this van lies under its body and floorboards. There are several components to the e-Bio Fuel-Cell system on top of the traditional battery and electric motor. Like modern fossil-fuel cars, the e-Bio NV200 uses a non-pressurized tank to store its liquid fuel. This ethanol fuel is then used in the Solid-Oxide Fuel Cell system to generate electricity, which in turn charged the 24 kWh battery. The only ingredients in the mix are ethanol and air. The ethanol’s corn and sugarcane sources are abundantly grown in North and South America, along with Asia, making it easy to come by. Dispensing the fuel would be a simple as adding another tank and pump handle at neighborhood filling stations. Regular, mid-grade, premium, and ethanol might one day be a normal sight when filling up. Nissan has not released any pricing information or details on when/if this e-Bio Fuel-Cell technology will be available. Undoubtedly, integrating the 100-percent ethanol fuel into gas stations will take a while, as will people’s acceptance of the new fuel source. However, the more people embrace the new technology, the faster the adoption will become. 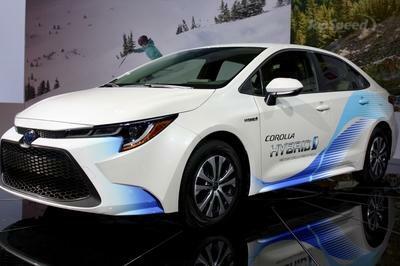 Other automakers will also need to jump on board before e-Bio Fuel-Cells become a widely seen commodity. 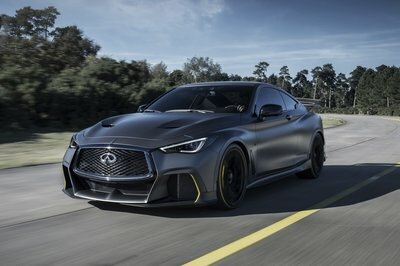 This is exciting news from Nissan. The e-Bio Fuel-Cell basically eliminates the headache of compressed hydrogen in a standard fuel cell vehicle, allowing the this fuel-cell system to use non-pressurized liquid fuel. It’s the best of both worlds. Drivers get the convenience of familiar fill-ups while reaping the huge benefits fuel cell and electric driving. 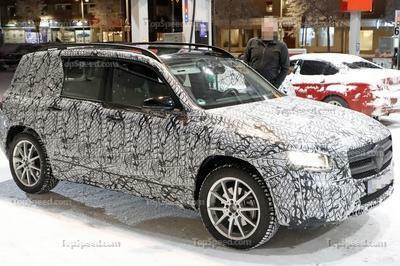 We will certainly be keeping an eye on this topic with hopes that it becomes a viable powertrain option in the future. 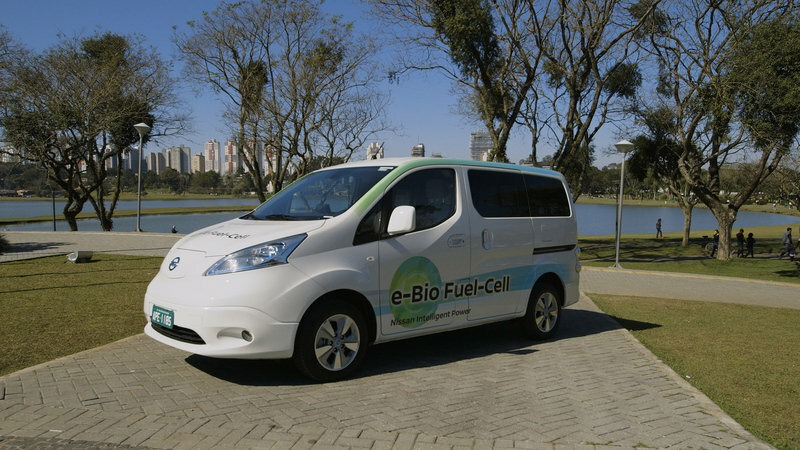 Yokohama, Japan (August 4, 2016) – Nissan Motor Co., Ltd. today revealed the world’s first Solid Oxide Fuel-Cell (SOFC)-powered prototype vehicle in Brazil that runs on bio-ethanol electric power. The breakthrough model, an all-new light–commercial vehicle, can rely on multiple fuels, including ethanol and natural gas, to produce high-efficiency electricity as a power source. 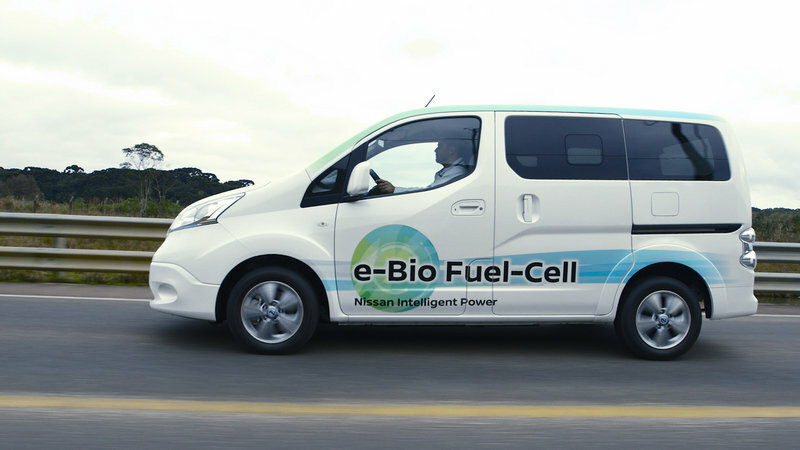 The fuel cell prototype forms part of Nissan’s ongoing commitment to the development of zero-emission vehicles and new automotive technologies including autonomous drive systems and connectivity. Nissan already sells the world’s highest-volume zero-emission car, the LEAF, and is pioneering Intelligent Mobility systems that will be deployed in a range of vehicles over coming years. In this latest zero-emission development, the e-Bio Fuel-Cell prototype vehicle runs on 100-percent ethanol to charge a 24kWh battery which enables a cruising range of more than 600km (373 miles). Nissan will conduct further field tests on public roads in Brazil using the prototype. 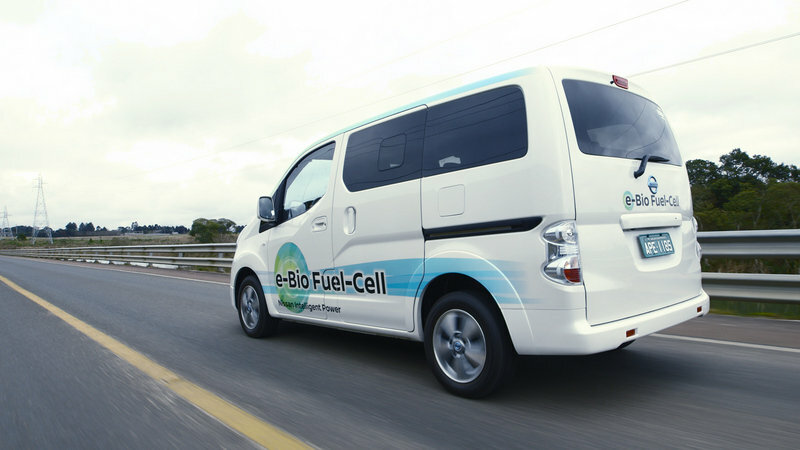 Research and development of the e-Bio Fuel-Cell was announced by Nissan in June in Yokohama. The powertrain is clean, highly-efficient, easy to supply, and runs on 100-percent ethanol or ethanol-blended water. Its carbon-neutral emissions are as clean as the atmosphere, which will be the part of natural carbon cycle. 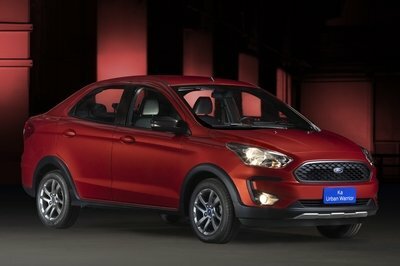 Also, the e-Bio Fuel-Cell offers the brisk acceleration and silent driving of an EV, along with its low-running costs, while boasting the driving range of a gasoline-engine vehicle. Bio-ethanol fuels are mainly sourced from sugarcane and corn. These fuels are widely available in countries in North and South America, which feature widely-established infrastructure. Due to the easy availability of ethanol and low combustibility of ethanol-blended water, the system is not heavily dependent or restricted by the existing charging infrastructure, making it easy to introduce to the market. In the future, people may only need to stop by small retail stores to buy fuel off the shelf. In pursuit of realizing a zero-emission and zero-fatality society for cars, Nissan continues to promote vehicle intelligence and electrification. Nissan’s brand promise of “Innovation That Excites” is delivered with “Nissan Intelligent Mobility”, which focuses on how cars are powered, driven and integrated into society through a more enjoyable driving experience. 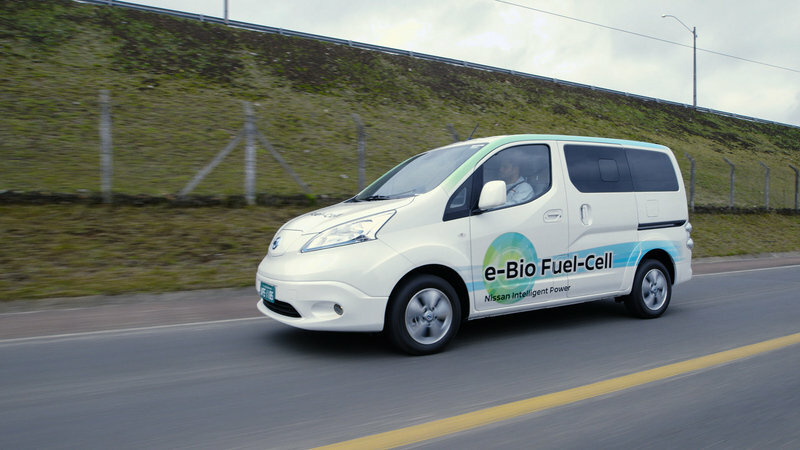 The e-Bio Fuel-Cell will realize the concept of “Nissan Intelligent Power,” promoting greater efficiency and electrification of cars and the joys of driving, alongside battery EVs, such as the “Nissan Leaf”, “Nissan e-NV200,” and “e-Power,” which is equipped with an engine housing an exclusive large-capacity motor and power generator. Nissan will continue to provide value to its customers by incorporating systems that enable the extraction of electric power from various fuels, while addressing the infrastructure issues tied to energy supply in every region of the world.